VANCOUVER -- Police officers involved in an undercover terrorism sting posed as spiritual guides and offered "dubious" and "eyebrow-raising" interpretations of Islam to a British Columbia man with extremist Muslim views, says an Islamic expert. Omid Safi, head of Islamic studies at Duke University in North Carolina, told a B.C. Supreme Court on Thursday that the RCMP should have helped John Nuttall overcome his radical ideas, instead of preventing him from reaching out to mainstream, moderate religious leaders. 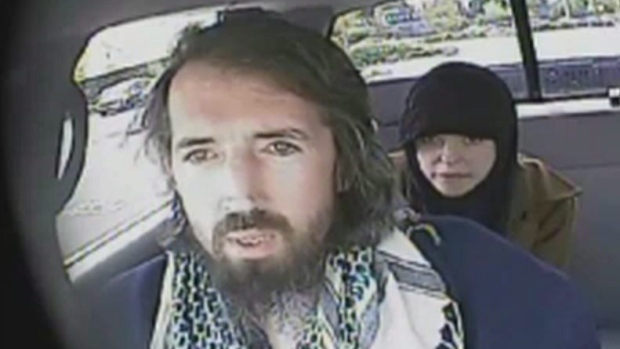 Nuttall and his common-law partner Amanda Korody were found guilty last summer of plotting to blow up the B.C. legislature on Canada Day in 2013. Their convictions are on hold while lawyers argue the pair was entrapped by police. "I think that deradicalization -- religious guidance from an authentic, certifiable imam with command over issues of Islamic law -- would be the proper course of action," said Safi, when asked what the appropriate police response would be involving a person with extremist views. Crown lawyer Sharon Steele pressed him further, asking whether his perspective would change if this person were in the middle of organizing a violent plot. "It would only add to the urgency of putting that person in touch with a qualified, scholarly source," he replied. Safi described Nuttall's understanding of Islam as shallow and superficial, informed by rambling and incoherent political grievances. Nuttall wanted to know where jihad, or holy duty, fit into his beliefs, Safi said. Transcripts from undercover surveillance recordings reveal Nuttall was searching for spiritual guidance and that he identified the main undercover RCMP officer as a religious authority and his one true Muslim brother, Safi said. Steele presented Safi with instances where Nuttall called into question the authority of mainstream religious leaders he had encountered and railed against their secular views of Islam. "I wish I could tell you that that's a sign of a jihadist. It's not. It's a sign of hotheadedness," Safi said, adding that he's encountered this exact situation dozens of times over his 24 years as a university professor. "Hot-headed, 18-year-old kids who think that they know everything about the faith getting up and telling a professor of Islamic studies, who has a PhD, you're preaching a soft, watered-down, Westernized Islam for the infidels. "What you're seeing here of course is rude, it's disrespectful. It's also absolutely a part of the landscape of modern Islam." Safi concluded his testimony on Thursday. Both Crown and defence lawyers hope to have final arguments in May, however that may be delayed as further applications are made concerning evidence.